On a recent weekend evening, Richard and I found ourselves caught up on the recordings on our DVR; the new season of our other favorite shows hadn’t yet started and no one was in the hospital. We decided to watch a movie and settled on World War Z. We hadn’t seen it in the theaters and it was available to rent right from our television. Not having to leave the house is an extra bonus for tired caregivers – goodness knows, I have been to CVS way too often lately in my sweats. 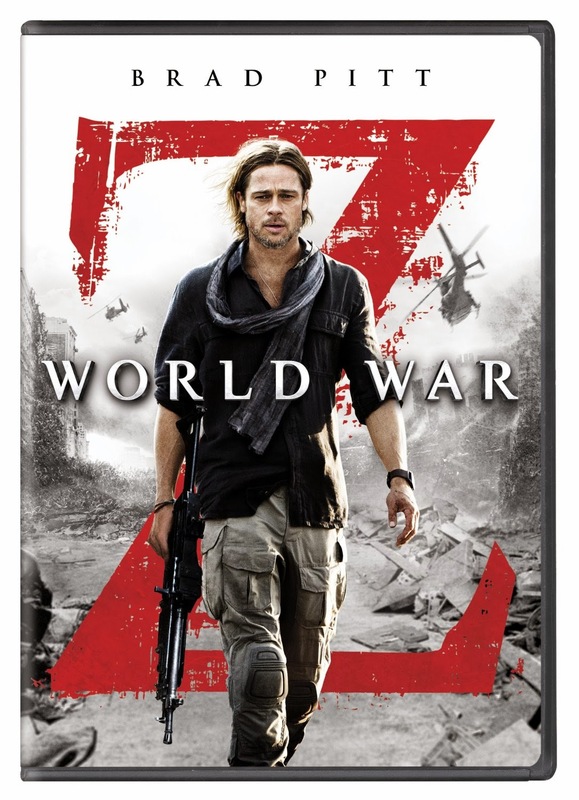 I hadn’t heard much about this movie but knew Brad Pitt was trying to save the world. That was just the sort of mindless distraction I needed! Robert was settled in bed watching as many episodes of Family Feud as possible while simultaneously doing his word search puzzle. I ran upstairs, grabbed the video monitor and set it on my bed to keep an eye on Robert. I snuggled in and the dogs followed suit: The puppy at my feet and Oz by my side, his head on my lap. Richard was standing doing his back stretches. Oh crap, I forgot the cat. Since Taz (The Crazy Puppy) is way more interested in Milky Way than Milky Way is in Taz, I wait until Taz turns into a Sleepy Puppy before giving Milky Way the all clear to come in and snuggle. “All clear” as in, I move Oz’s head off my lap, move the video monitor out of my way, get out of bed and go to the bedroom down the hall to get Milky Way. If I’m lucky I can sneak back in bed without Taz waking up and Milks can lay on one side of me, Oz on the other. Okay. Now I’m ready. Start the movie! Oh, wait. I need some water. Hmm. If I wait, Richard should be going downstairs any minute to get some water or a snack. Waiting. Pet the cat. Pet Oz. Rub my feet on Taz. Why, yes, honey! Thank you! Could I have some water, please? Richard returns upstairs with a bottle of water for each of us. The alarm on my phone sounds. Argh! It is the last medicine time for Robert. Good evening, Robert! Here are your meds. It’s Saturday so you can stay up late watching TV if you want. Yep, church will be recorded so you can still sleep in and watch it any time you want tomorrow. Okay, I’m going upstairs to watch a movie with Richard. Good night, Robert. God bless you too. I’m starting to think I live in a house with John Boy. Up the stairs I go, move the cat, crawl into bed, put the cat back down, scoot Oz over since he’s encroached on my space and yank the covers out from under him. 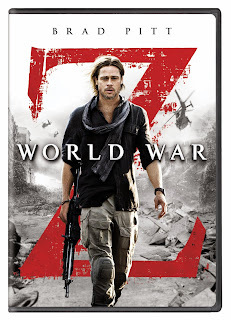 I don’t know what to expect from “World War Z” other than Brad Pitt saves the world. I wonder what he is saving the world from and assume it is probably aliens. The world is always in jeopardy because of aliens. The movie starts with Brad Pitt in family-man mode which, for whatever reason, I find completely unbelievable. I realize he has about 110 kids with Angelina Jolie but I think his portrayal of “dad” is unrealistic. While mulling over why I don’t think Brad Pitt plays a realistic dad, I soon realize why the world is in jeopardy. And it’s not helping the movie be any more realistic. Ohhh, so that’s what the “Z” means! Gotcha. I get it now. I’m going to have to let the “realistic” expectations go and just see where this movie takes us. The problem I foresee is I am not much of a zombie fan or horror fan nor do I like to be scared. I do like suspense movies so decide to give this a chance. Plus, I kind of like that zombie in the phone commercials. This could work out okay. The movie was a little on the gross side but there was a lot of action and suspense. There were even a few heartwarming moments and one terrific (and terrifying) scene with Brad Pitt trying to outwit Michael Jenn playing a zombie in the World Health Organization lab. Wow. That guy really knows how to make a zombie seem realistic and disturbing. The teeth chattering alone was bone chilling. I get the creeps just thinking about it. The movie was surprisingly enjoyable and definitely kept me on the edge of my seat (or that could have been Oz stretching out and scooting me off the bed). Surprisingly (probably only to me), the movie is rated PG-13. I say surprisingly because I am easily scared but realize not everyone is such a scaredy-cat. “World War Z” was released in 2013 so it’s too soon for the purchase price to drop but if you like to be scared and watching zombies is your thing, you can purchase it for $16.99 on Amazon. We only paid around $4.99 for the rental which was just perfect for a movie night at home (where I can wear my sweats without worry). The teeth chattering zombie scene alone was worth the price! “World War Z” gets three out of five scoops of Rocky Road Ice Cream from Robert’s Sister. Which actually sounds pretty good right about now – I need some help getting the images of those zombies out of my head.